know for sure whether or not God saw fit to make matter think. ignore or evade attributing solidity to souls. temporal origin determ ines it s identity. or being, as body itself; and so is capable of motion (II.xxiii.19). possess it, that it excludes all other solid substances; (II.iv.2). all other substances of the same kind. things of the same kind requires it to be solid. 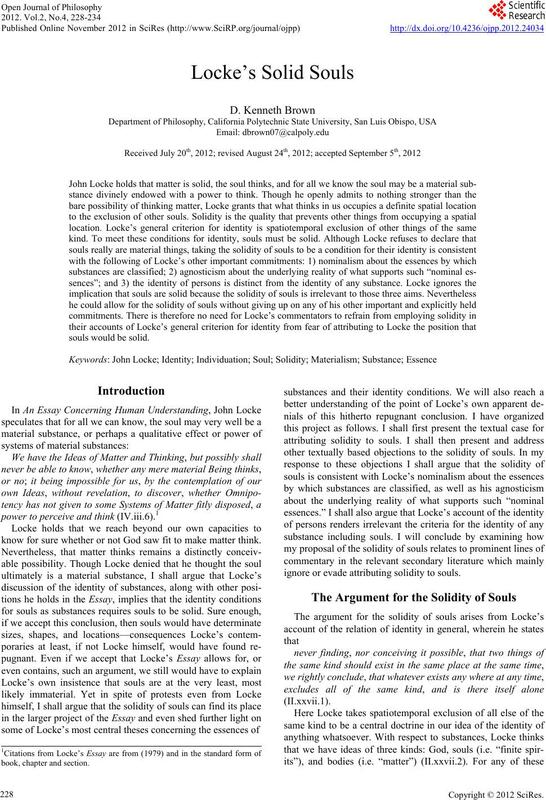 Locke’s principle of identity is “existence it self” (II.xxvii.3). cation of the relation of identity to the individuation of things. properties a cogitative being may possess. no-where else to be found or imagined, but only in matter. handle sufficiently furnish us with (II.xxvii.2). of any body no matter what state that body may be in (II.viii.9). seems that he should somehow deny the solidity of souls. of other bodies requires the body to be solid. it has the modification of thinking or no (Letter, 33). place. 6All references to Locke ’s r eplies to Stillingfleet are to Locke (1823). said concerning the faculty of thinking in matter” (294). properties of matter; but matter is in these things matter still. because it destroys the essence… (460). thereby quite different from the transfer of motion by impact. power to sustain the superadded qualities. not allow us to draw? scure about the idea of the thing. thinks in us has a real essence that is responsible for thinking. nominal essences, and not real essences. is indisputable that we have an idea of that in us which thinks. ity—they are different ideas, but in no way exclude each other. 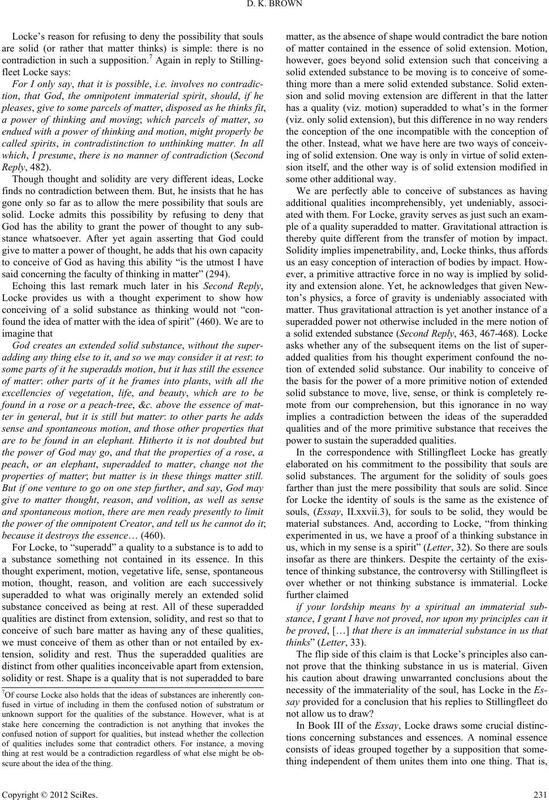 idea of souls as immateri a l .
tions of the mind “without consideration of matter” (III.vi.11). So what does this mean for the choice between (2) and (2*)? solidity ought to be related—that is, if souls have identity. material substance eliminates the possibility of resurrection. spiritual or otherwise, and may belong to several (II.xxvii.10). and neither has he any reason to work out its implications. distinct from the identity of an organism as a lump of matter. temporally distinguished from other substances. 11See also McCann (2001: pp. 92-93) and McCann (2007: pp. 177-185). 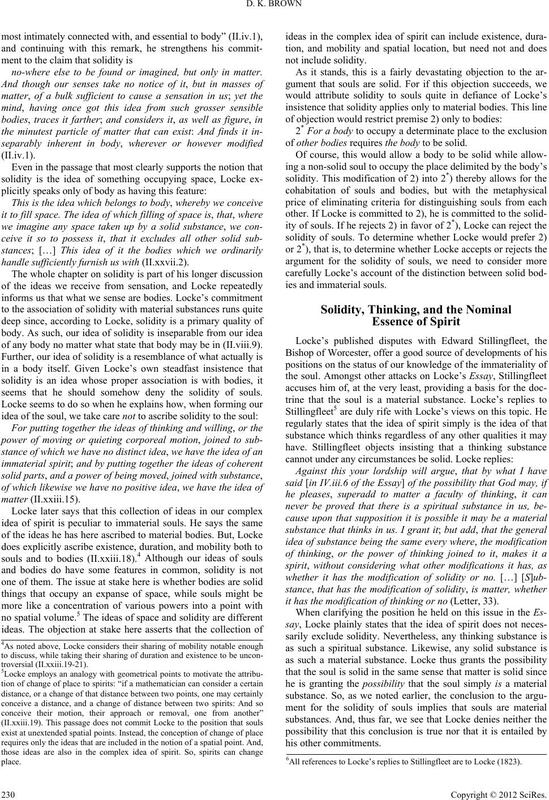 the possibility of thinking matter remains merely a possibility (Vol. 2, p. 149). would yield a total set of qualities including no contradictory qualities. bility that thought be superadded t o matter (98). place of a spirit? Nothing from what I can make out in Locke. 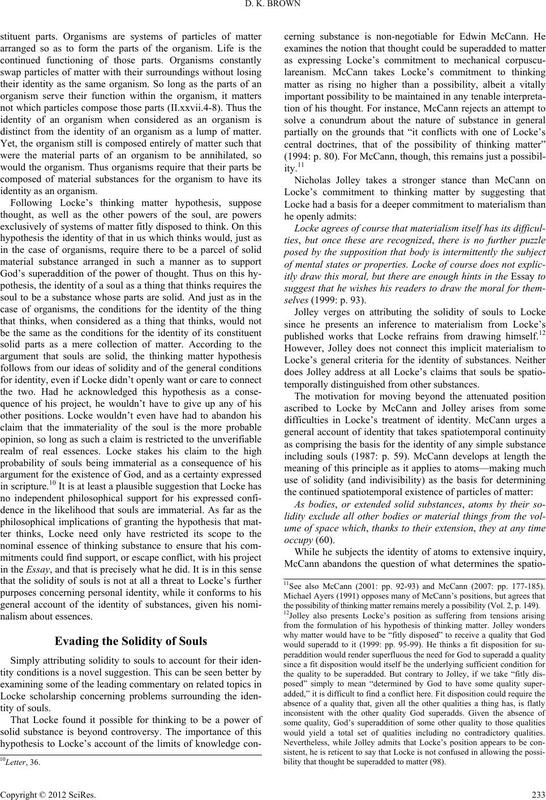 any sort, then, is the creation of solidity (1992: p. 310). 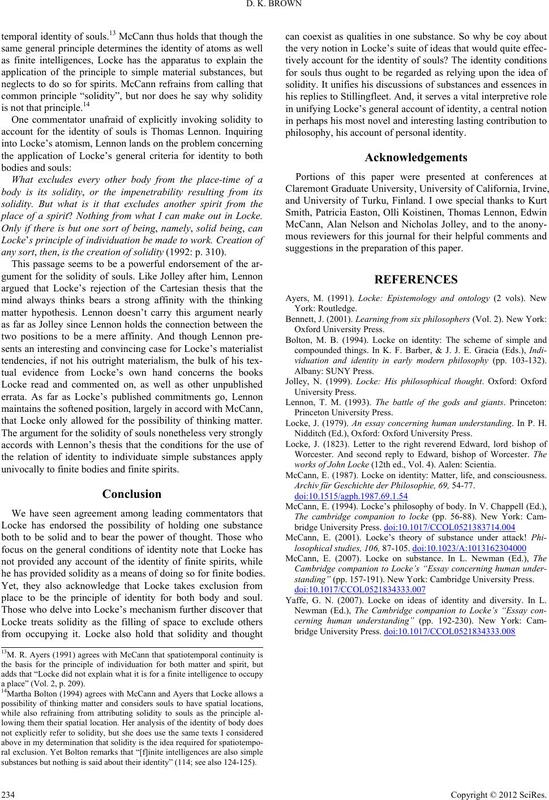 that Locke only allowed for the possibility of thinking matter. univocally to finite bodies and finite spirits. he has provided solidity as a means of doing so for finite bodies. place to be the principle of identity for both body and soul. philosophy, his account of personal identity. suggestions in the preparation of this paper. viduation and identity in early modern philosophy (pp. 103-132). Locke, J. (1979). An essay concerning human understanding. In P. H.
Nidditch (Ed. ), Oxford: Oxford University Press. works of John Locke (12th ed., Vol. 4). Aale n: Scientia. McCann, E. (1987). 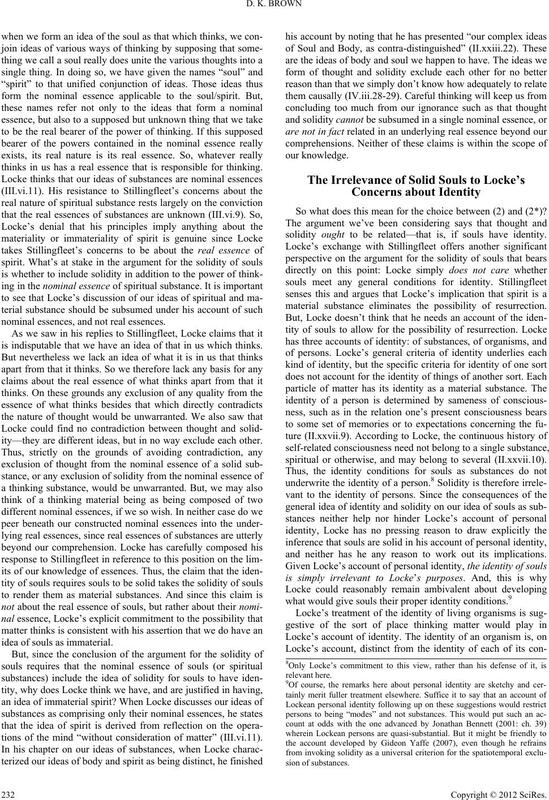 Locke on identity: Matter, life, and consciousness. Archiv für Geschichte der Philosophie, 69, 54-77.
standing” (pp. 157-191). New York: Cambridge University Press. Yaffe, G. N. (2007). 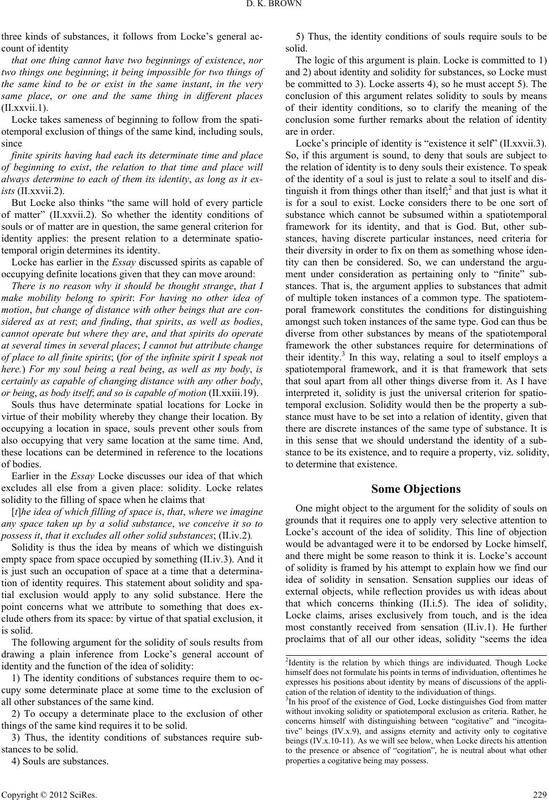 Locke on ideas of identity and diversity. In L.
a place” (Vol. 2, p. 209). substances but nothing is said about their identity” (114; s ee also 124 -125).